Cygnus-A the perfect example of a cosmic electric generator. Cygnus-A as giant electron accellerator: The radio lobes receive their energy from jets which originate in the nucleus and extend 0.2 Mpc. The radio radiation is produced by synchrotron emission of relativistic electrons. 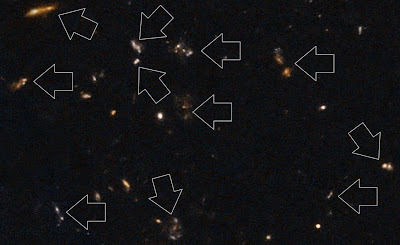 Radio galaxies are giant particle accelerators with Ee˜10^12 eV. leading to what is called anomalous resistivity and ion-electron drag, leading to an enormous current and magnetic field!! The electric universe!! 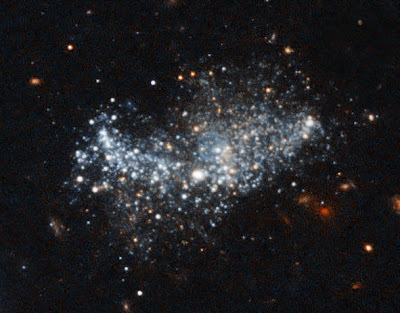 The Hubble background of I Zwicky 18 contains several clear cut early galaxy dumbbell structures, with the same structure as Herbig Haro objects, just like Cygnus-A, see below. 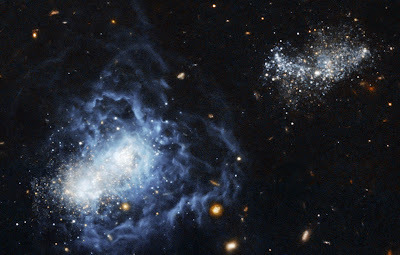 In the forground we see: the small I Zwicky 18 Galaxy, with companion, which has also a clear dumbbell structure like Cygnus-A. Conclusion: this companion-Galaxy should be the intermediate Galaxy form between Cygnus-A and I Zwicky 18 itself. 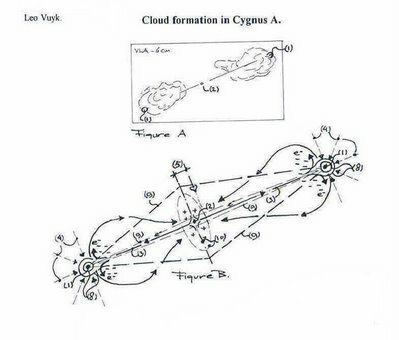 Cloud formation around Cygnus-A with double electron jet structure and ionisation of interstellar matter. I Zwicky ( leftside) and companion together. 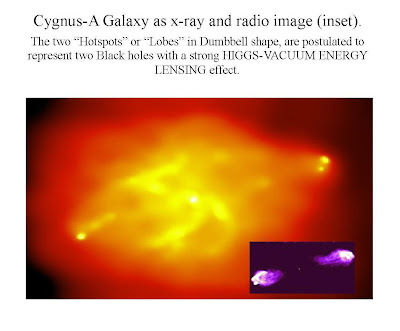 The "mainstream interpretation" of CYGNUS A is that a giant black hole is located at the centre of this bipolar Galaxy, which emits bipolar synchrotron jets. These jets are interfering with the interstellar medium creating "lobes"and they end in so called "hotspots". However, according to Quantum FFF theory, the fact the Cygnus A is so extraordinary luminous has to be found in the observation that there are not two hotspots but four hotspots and probably because these NEW black hole hotspots have a considerable size. Four hotspots in line with each other is a sign for a so called merger of two "early" spiral galaxies with aligned polar axes. 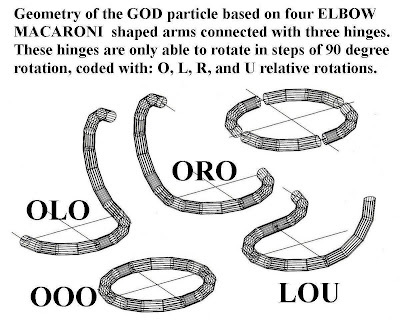 My alternative interpretation of Cygnus A, is based on the simple rigid "4x elbow macaroni" particle model, able to change form and combine into compound quarks. As a result Fermions are repelled from the horizon of these NEW massless black holes, which is the main reason to change black hole places for all cosmological systems equipped with a bipolar structure and thus for Cygnus A.
Synchrotron radiation and magnetic fields. At the same time electrons are accellerated in the form of jets "pushing"the two black holes away from the centre, ( Fermion repelling horizon) and form ionized zones in combination with synchrotron radiation and large magnetic fields streching over the whole area. 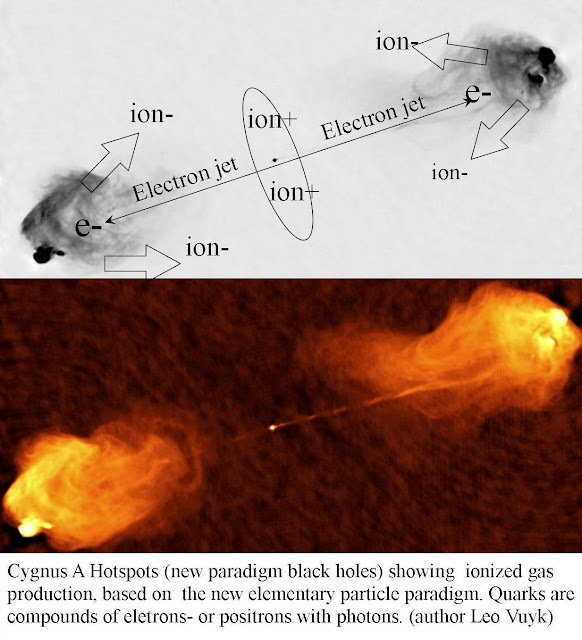 At least 2 dual "new" black holes, located inside the hotspots at the end of the synchrotron emitting electron jets ( and not inside the centre) plus the large magnetic fields are the origin of gravitational-red shifted and electrified plasma and ionized gas. Positive charged inside the centre and negative charged at the lobes it is THE example of a cosmic powerhouse and gas- and star forming region, which is nearer than we thought, because the redshift is supposed to be gravitational around a hotspot black hole! Comparable dual black hole based systems with different sized Black Holes, are supposed to be the main origin of all complex cosmological systems from Herbig Haro systems up to Galaxy Clusters and the origin of Dark Matter. 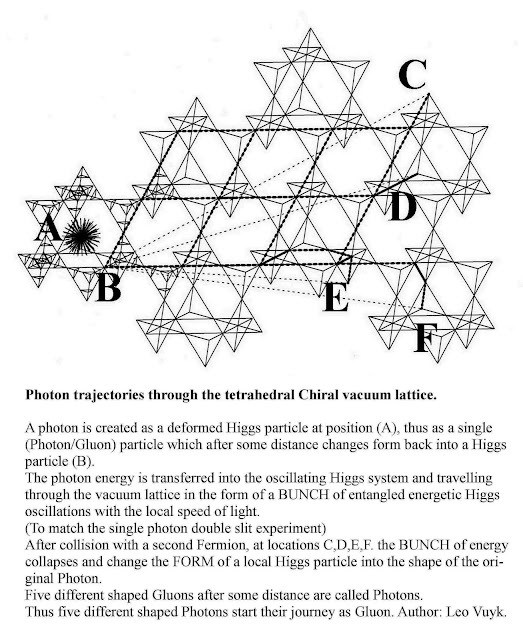 This FUNCTION FOLLOWS FORM (FFF) theory is based on the assumption that the electron (and positron) has an internal (propeller) structure and two kinds of rotation at the same time originated by the collisions of the oscillating Higgs vacuum. 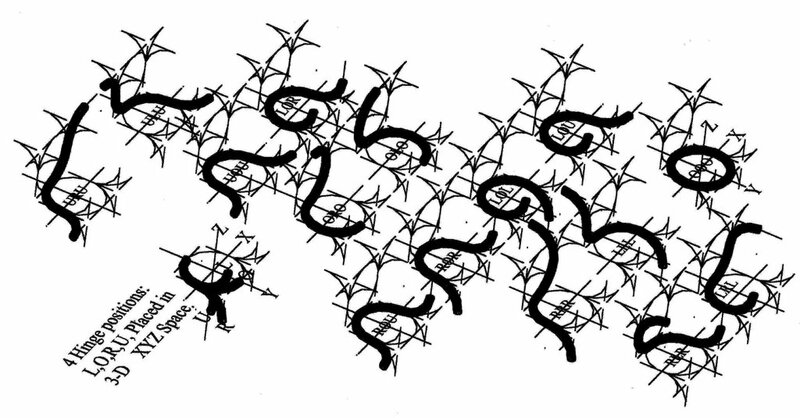 The vacuum itself seems to have a continuous tetrahedron alike chiral lattice structure. 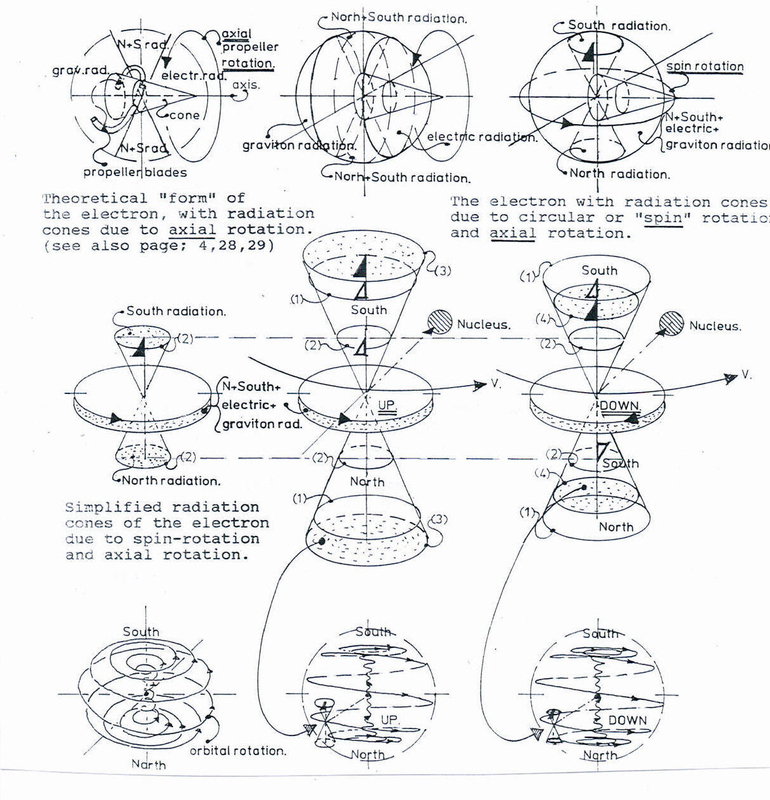 The two rotation axes of the electron are always oriented perpendicular to each other. The ring shaped Higgs particle is CONVERTABLE into all other singular elementary particles such as Neutrinos, Gluons and Photon particles. 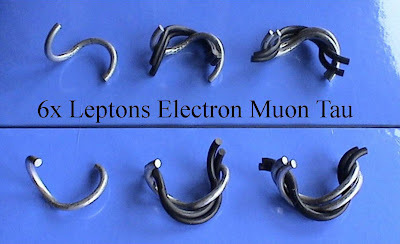 MUON, TAU and QUARKS are supposed to be compound or composite particles. The propeller shape of Quarks and Leptons is THE origine of the repulsion of Fermions by a new spin flip process just outside the black hole event horizon. 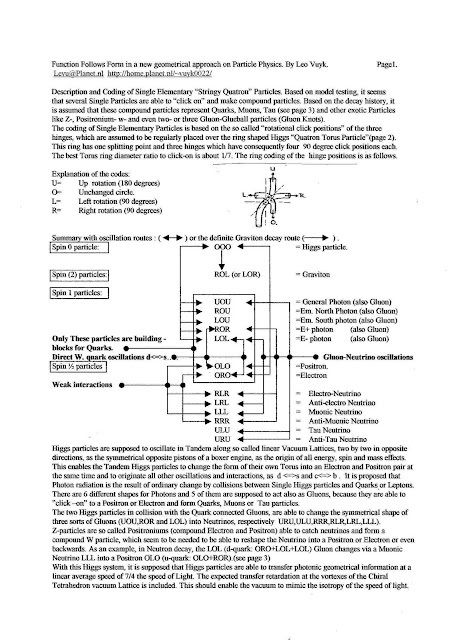 Not compound particles are: the electron or positron, 6x Gluon/photons and all 6x neutrinos if we follow the FFF system hich we will call the QUATRON system. Four elbow macaroni shaped Beads on a unbreakable string with 3x hinges between the four beads. The three hinges can have four positions of rotation, 90 degree separated from each other. so these positions are coined: L,R,U and O. ( Left (L), Right (R), Up (U) and Circular(O). The result: ONLY 7X PARTICLES ARE NEEDED TO MAKE A WORLD (and anti world)! 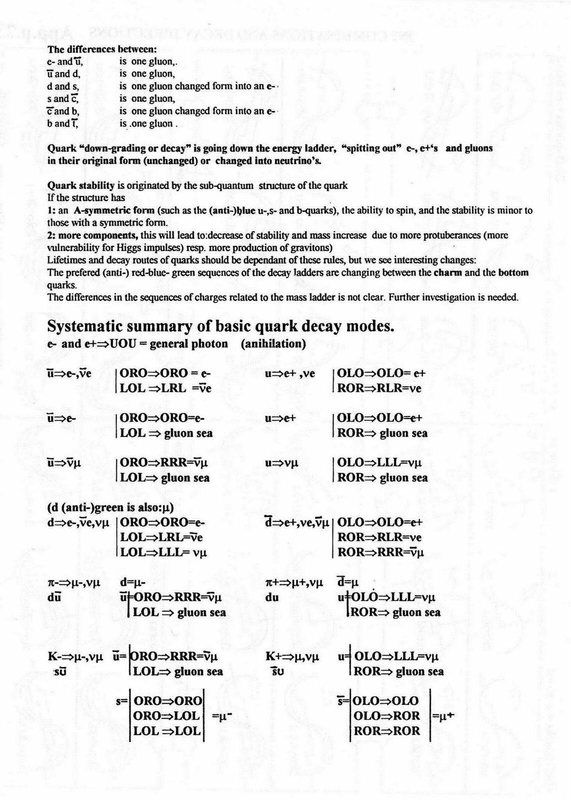 Electron Positron and 5x different shaped monopole Photons/Gluons are needed to make all compound quarks. The start of a new STANDARD MODEL of elementary particles. Your special attention is asked for the difference between the "Gluon Neutrino oscillations" and the "Weak interaction oscillations"
Quarks are supposed to be"compound particles as combinations of electrons (for negative charged quarks) or positrons (for positive charged quarks) with 5 different shaped gluon/ photons. 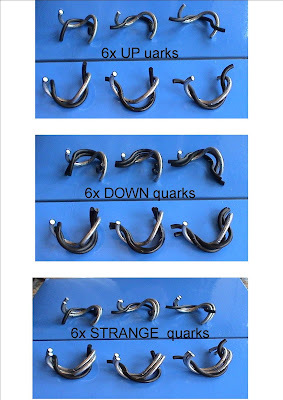 As a result, QUARKS have the same size as electrons or positrons, however they have more intense interaction with the Higgs vacuum, leading to different radiation patterns like more graviton production. 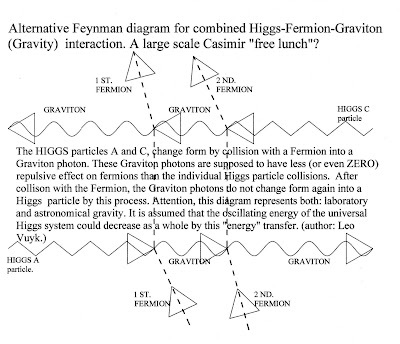 Alternative Feynman diagram or collison scheme for GRAVITY. 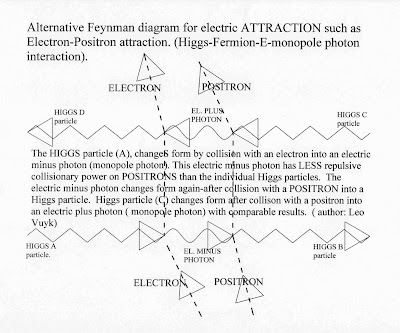 Alternative Feynman diagram or collsion scheme for ELECTRIC ATTRACTION. 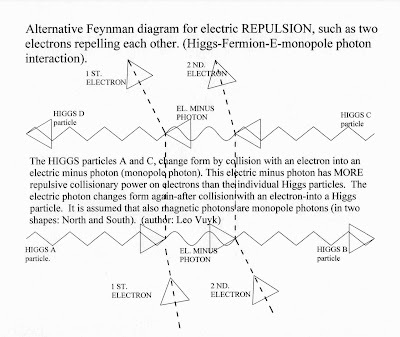 Alternative Feynman diagram or collision scheme for ELECTRIC REPULSION. A new way of looking at up- and down spin fermion propellers. A new way of looking at magnetic fields. 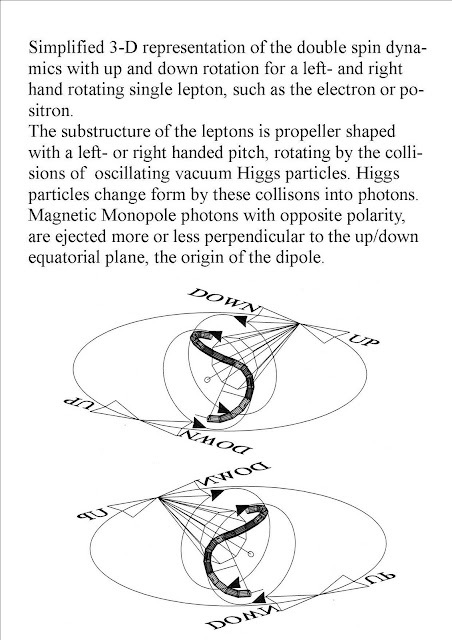 A start to understand the Aharonov Bohm effect, because now we see how even outside the long solenoid there are parallel directed North and South monopole photons in action, causing the electron to polarize up or down. 4 x90-degree "elbow macaroni" Beads on a string. in combination with one "splitting point". 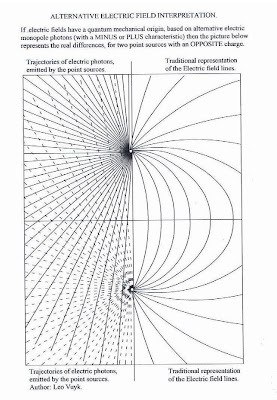 A new way of looking at electric fields. 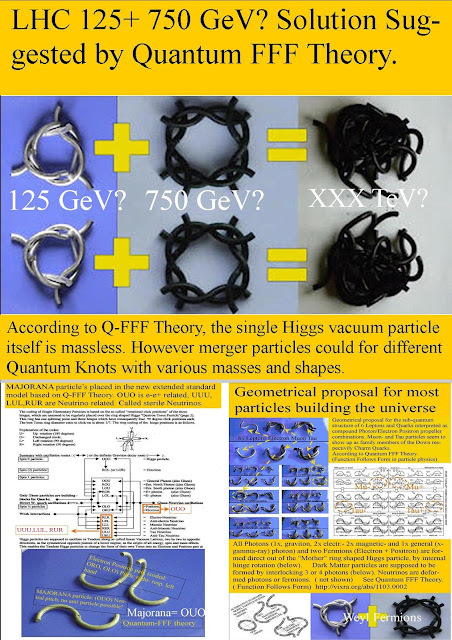 A solution for the fundamental particle symmetries in physics. Representation of the proposed Lepton family. We see the mirror- anti particles also: positron, anti muon and anti Tau. 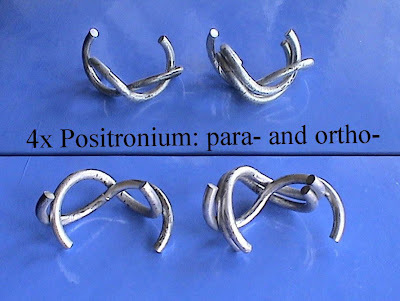 The proposed positronia configuration, para- and orthopositronia. According to this model, the positronium is not a so called "exotic atom" with the electrons and positrons swirling around each other, but looks more like a "special quark" or lepton( see above). 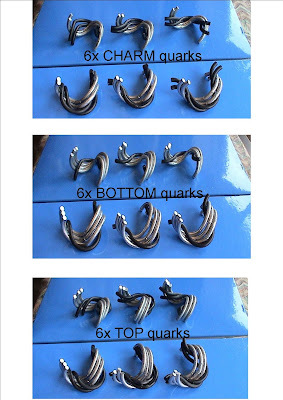 This special quark is assumed to be made only from electron and positron- propellers, so without the Gluon-Photon knotty compound combination and without a propeller form, with left or righthanded pitch( shown for quarks and leptons). As a consequence, the positronium has no electric or magnetic dipole!! It is easy to see, that there is less ROOM inside the knot for the three particles then for two particles, so the mutual "pinch force" will be larger and also the decay stability as a concequence. 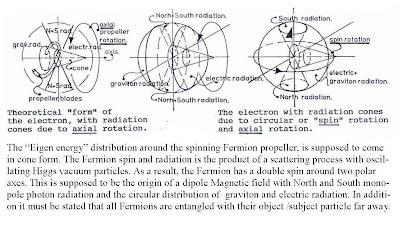 The fact that this particle has no propeller shape like the Fermions, means that it is not able to rotate and not able to produce ( by Higgs collision transformations) other photons than gravitons! 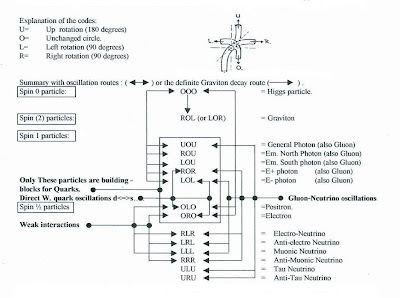 (electrons and positrons are made silver, gluon-photons are in black). 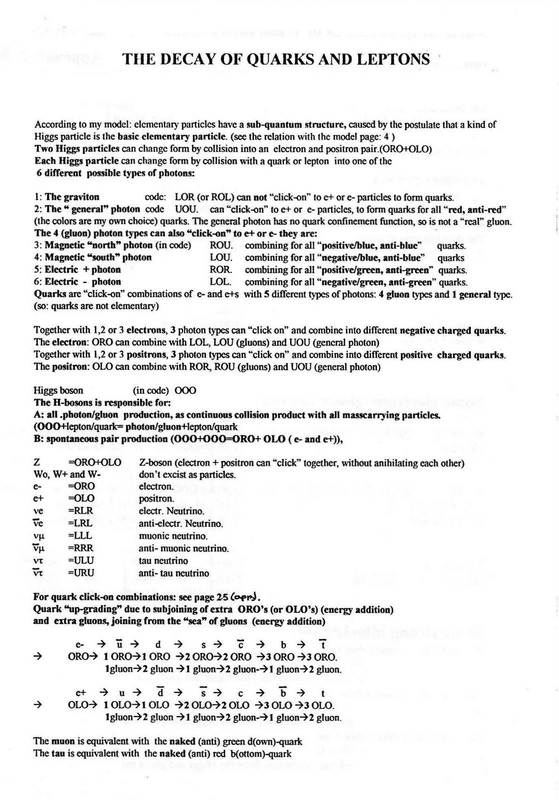 Short description of rigid particle hinge principles. 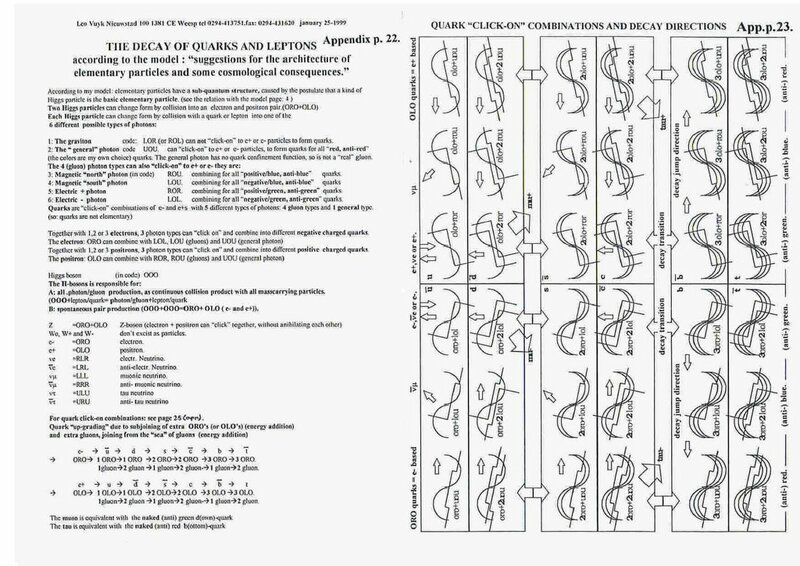 Keywords: microstructure of elementary particles, quark microstructure. 3-D visualisation of naked elementary particles. The author is an architect and amateur in the field of physics. I made my alternative particle model 14 years ago (see figure), as an architectonic exercise to study the possibilities for flexible architectonical spaces. I found out that these spaces could combine and “click-on” with two or more units, to each other and create COMPOUND structures. For click-on compound ability however, it is of interest that the diameter ratio between the diameter of the ring en the diameter of the tube should be around 7:1. These structures had the same “click-on characteristics” but with different force to click-on or click out. I also realized that the decay processes of elementary particles like quarks could perhaps be mimicked with this system and that the single particles could be found to be the SUB-QUANTUM base for all the known particles of the “standard model” in this "supersymmetric particle model"..
Quarks are supposed to be compound particles, but Electrons, Positrons, Photons, Gluons and Neutrinos are "single" particles, which are coded by the position ( LORU: Left, O: ring, Right, Up) of the three hinges ( see figure). 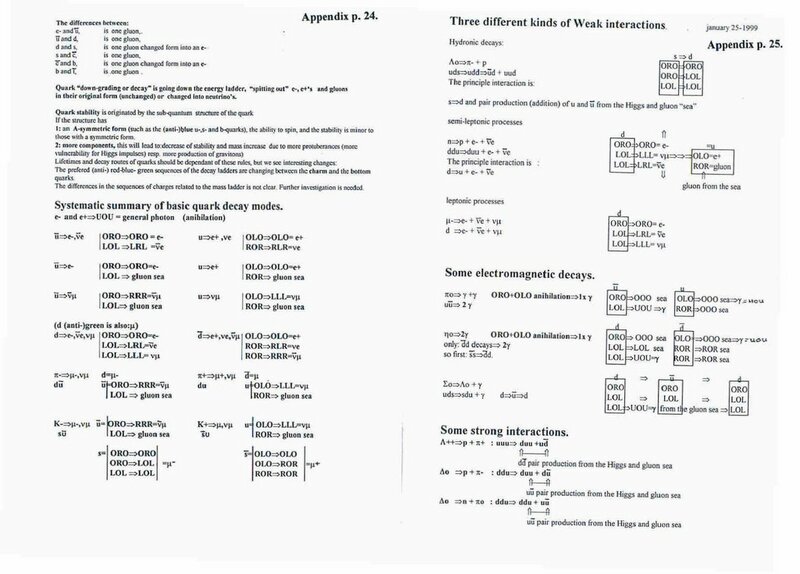 This raised the possibility to interpret electromagnetism as the quantum mechanical FORM collisionary interaction between monopole photons ( -,+, electric and even North- and South magnetic photon-particles) and Fermions. So I practiced with lots of real compound models made out of standard rubber rings with a 4 cm. ( 1.5 inch) diameter and tried to get a reaction from professionals. All well known decay processes of particles could be mimicked by this "click-on system" of transformable Higgs particles system. 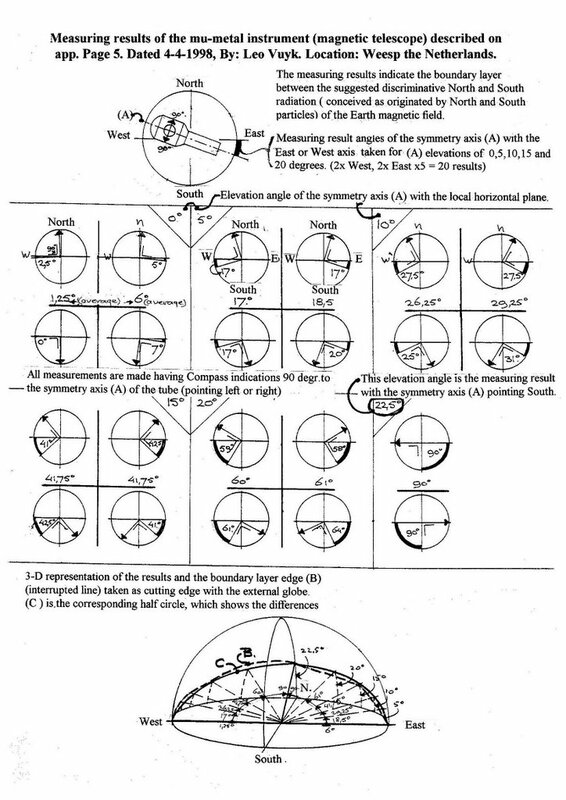 ALSO: and a new successful experiment to show the different North and South monopole radiation components of the earth magnetic field by a simple Mu-Metal ( permalloy) tube- compass combination. 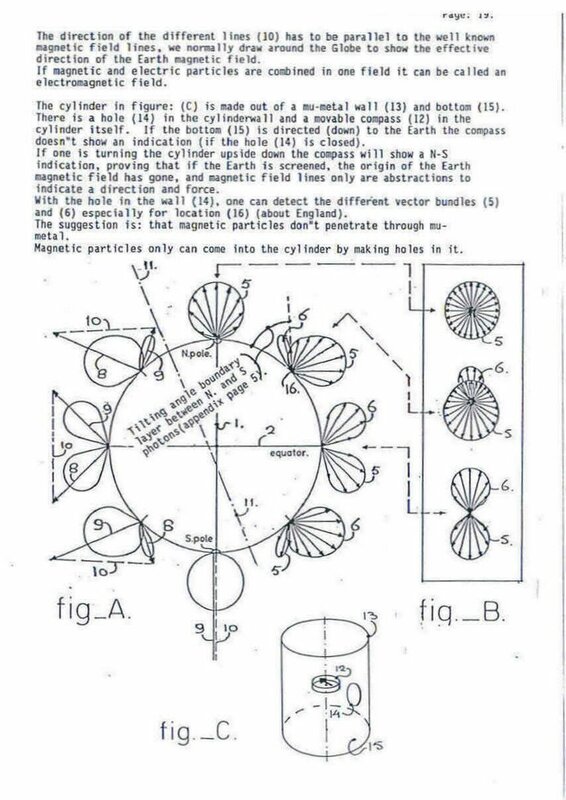 Rigid Electron and Positron particle PROPELLERS with dual rotation and video camera in vertical motion. The colliding oscillating Higgs particles and the resulting gluons-photons are not shown. 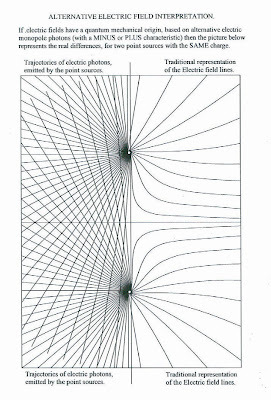 The vertical axis is the axis of the magnetic field. 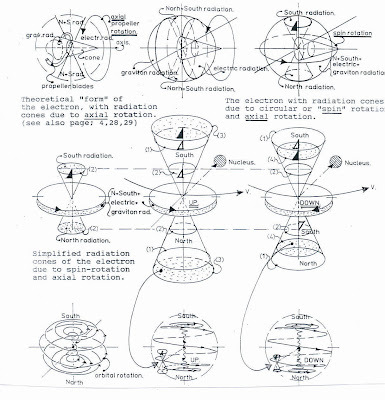 The central axis of the 2x rotating cone represents the direction of the graviton radiation ( at the base side) and the electric radiation ( at the top side of the cone) . 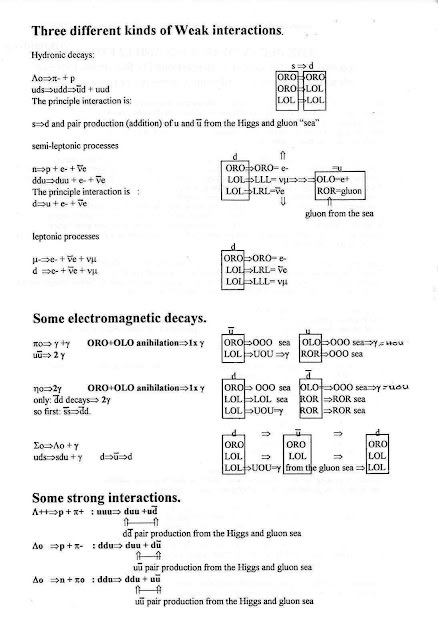 For electrons and negative quarks, this is electric negative monopole radiation. For the positron and positive quarks, this is electric positive monopole radiation. Video of DOUBLE SPIN ROTATION OF THE ELECTRON and POSITRON.